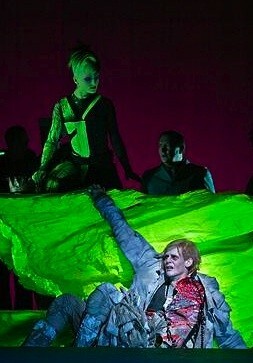 Bostridge sings very tough music. Bostridge performed in Thomas Ades’ The Tempest at Covent Garden. Dowland's In Darkness Let me Dwell, the 17th century's most noted song, opened the program. The song comes out of silence and darkness, reveals itself and then recedes. Sting often performs the song and compares favorably with Ian Bostridge in singing with a harsh edge. For listeners familiar with Bostridge's superb tenor, this "sting-side" in his voice is a surprise. Clearly when the singer moves from the baroque repertoire to Schumann and Schubert, and the late songs at that, he is opening his heart to darkness and to the pain of life, not the light and beauty so often depicted in the baroque repertoire. Not only has Bostridge challenged himself, but, in taking risks, he displays an extraordinary ability to range from baritonal depths to almost soprano heights. This is very difficult turf, but you would never know it as you listen. 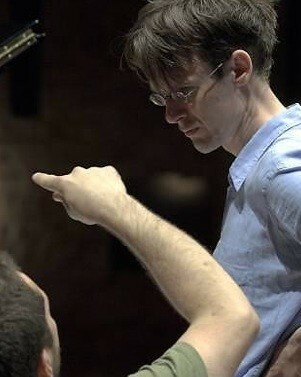 Bostridge and the composer, pianist, and conductor Thomas Ades, passed the music to and fro. Sometimes compositions drew them into parallel play; at others, they traveled, as directed by the composer, in opposite directions. Sometimes they left each other alone. For the second piece on the program, Ades performed his own take on the Dowland. The characteristic Ades wingspan, from the furthest reaches of the keyboard, touching also hammers and contrasting harplike trills in the middle, echoed the Dowland and expanded on it. Surely this wide, dramatic bracket was the platform of the evening. A radical take on Kurtag's suspended Holderin: An... prepared us for an unexpected and inconclusive evening. The Schumann song cycle Dichterliebe is based on Heine poems. After enduring great personal suffering and frustration, Schumann was ripe to find inspiration as he probed the heart of a lover's experience. 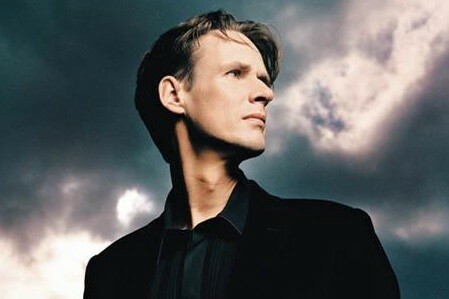 Bostridge in the sheer beauty and power of his voice captures all of the intensity and economy of the music. As an artist, Bostridge is in complete control, soaring through a daring and difficult dramatic range. His pianissimos often go to silence, illustrating how much 'no sound' there is in the sound of music. So intense were the first two Schumann songs, that we laughed in relief as the performers smiled and danced in the third, Die Rose, die Lillie, die Taube. To the accompaniment of semiquavers, the singer scarcely has time for a breath. Each song in the cycle was displayed with its singular character, but overall, tears are not distant. Yet tears fade as they water they produce grows flowers. In Ich grolle nicht, where quaver chords suggesting beats of the heart and belie the resignation of I bear no grudge when my heart is breaking, powerful emotions were unleashed. In the final song of the cycle, a portamento transports the voice up an octave, where it switches keys "because in it are buried all my love and sorrow." In nearly a page of arabesques Schumann seems reluctant to leave the songs. So too were the audience at Carnegie. Liszt got his place in the sun as Ades performed the Petrarch Sonnet No. 123 solo and then was joined by Bostridge for three Liszt songs. Concluding the evening were seven Schubert songs. Some say that Die Stadt with its monotonous wave figure punctuated by two chords, like oars beating the water, is a portrait of melancholy without parallel. From a technical viewpoint, the lyricism, recitatives and dramatic tremoli of Am Meer, with its pure vocal line, are impossibly difficult to sing in the required adagio. This Bostridge did without straining. Doppelganger is spoken speech at the service of music, the singer and piano moving parallel to suggest a man and his shadow. Repetitions like "my love dwell" can seem like mannerisms, but they never failed to move. Yearning is dispensed with one cry. No more self pity. To make a perfect evening even more so, Bostridge's German diction and his expressive take on the language is exquisite. Not surprising since Bostridge at twelve studied German with an instructor who used Schubert songs to teach the language. Bostridge was hooked, but did not break into a singing career until he completed his PhD in history from Oxford, where he became an expert in witchcraft. The first encore was an aria from Ades opera, The Tempest, which whetted the appetite for its new production at the Met next season, hopefully with Bostridge in the cast. The final final was the familiar Schubert Serenade. As Bostridge listed into the piano, he sang, My songs quietly implore you through the night. The evening ended as the Schubert Serenade does, Come, bring me bliss. No one wanted this extraordinary performance to end. But we left feeling bliss, as we await another performance by these two consummate artists. "Look for these artists. You should be there next time!" "Thank you for this beautiful review. How I wish I could have been there."